This app is perfect for individuals that struggle with appropriate personal space. It teaches about relationships, social boundaries, and safety. Win this app June 29th, 2016! Welcome to the world of circles! This app is perfect for individuals that struggle with appropriate personal space. It teaches about relationships, social boundaries, and safety. I was privileged to review this app. I have had multiple parents inquiring about apps that prevent abuse, and teach safety to special needs children. Many kids with Autism struggle with personal space and community safety. They struggle to understand what is appropriate and what is not. This app really can help with that. It is very visual. The colors are bright. The illustrations are personable. The interface is easy to navigate too. Let’s begin! 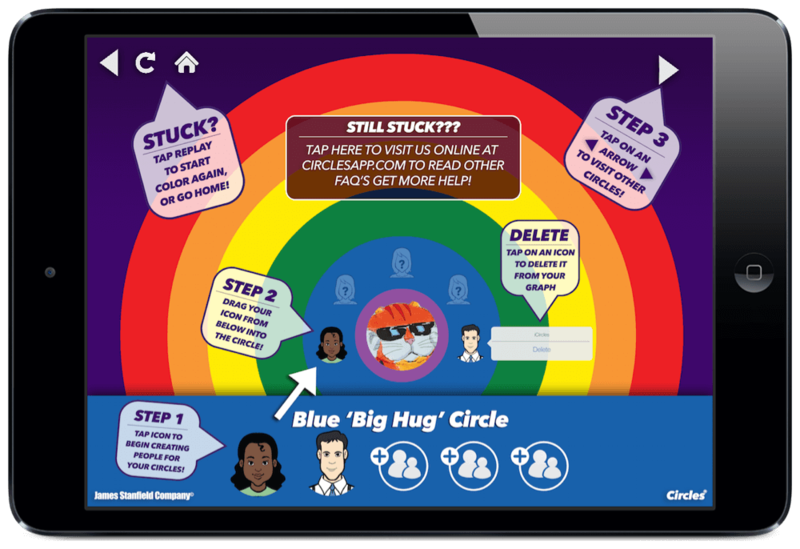 As you progress through the app, you will be stepped through a presentation on the different circles or relationships you might have. You will add new people into each circle and organize your relationships with those people. This system will help you understand which relationships are closest to you and therefore permit a hug, a handshake, or a high five as you see them. It will also make clear which ones should never warrant touch. The narrator that steps you through this app is fantastic and really covers a broad range of concerns and questions you might have. 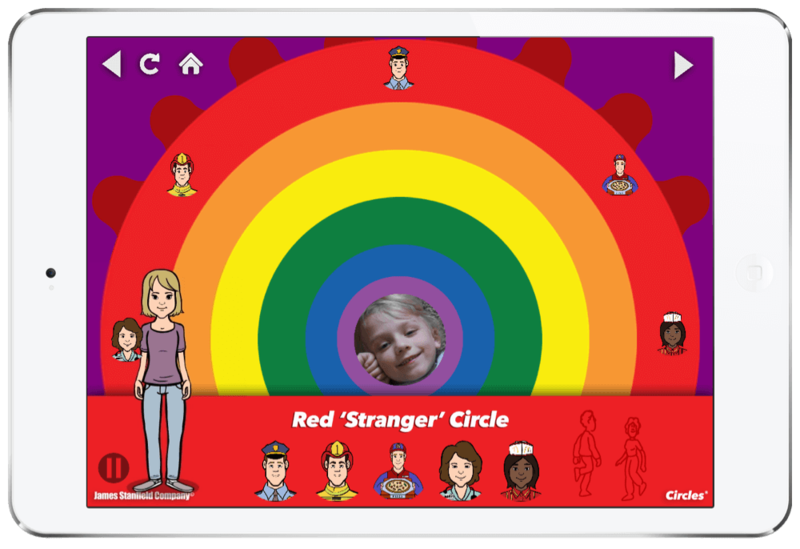 The Circles app comes from the very successful Circles curriculum. It is a research based program that was proven effective by Harvard University. It has been used in many schools across the country and teaches about social boundaries as well. 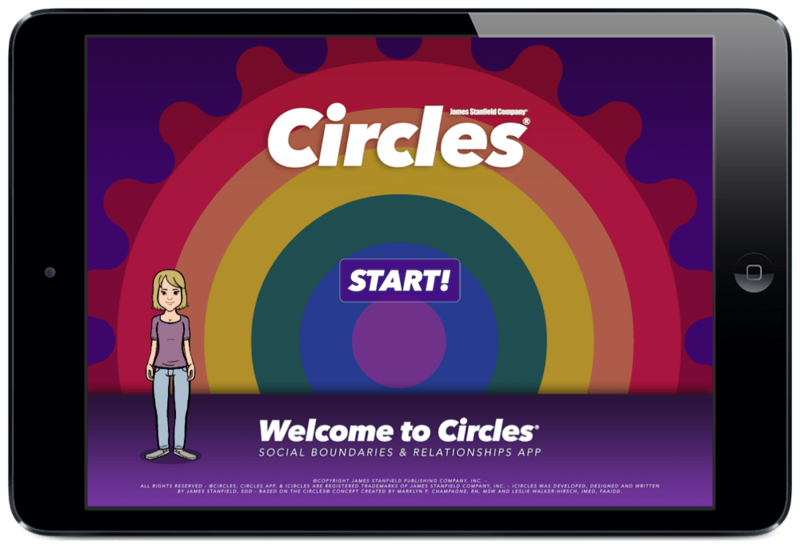 The Circles app allows users to clarify and define their own social boundaries. You can learn more by visiting the Circles app website. When you open the app, you will press “Start”. You have a few options from there but you will notice a woman that talks you through each step. The character is unique because she stays with you through the entire app and acts as a guide. The voice for the character is perfect too because it is calming but direct. When creating a profile, you have a few options. You can use one of their charming illustrations. 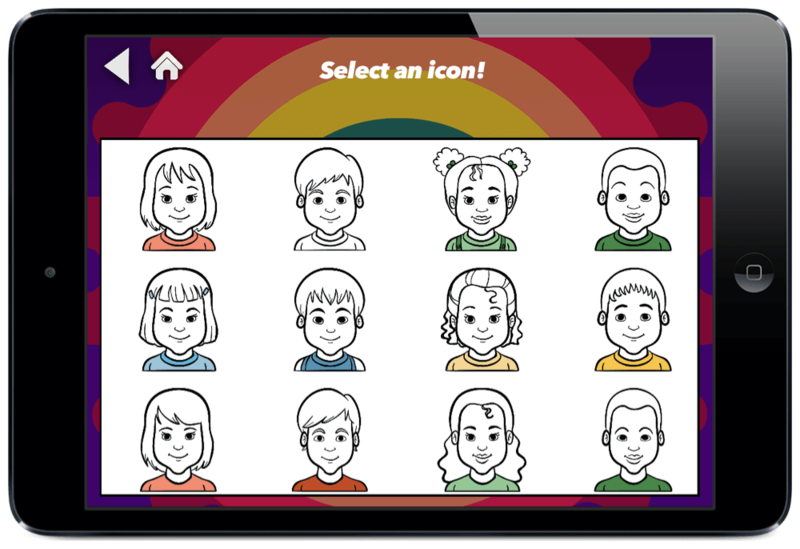 The characters allow you to change the skin and hair color. You can also choose an image from your camera roll or take your own photo from your device. You can only have three profiles at a time. I would love an option for unlimited profiles. That would be incredibly helpful for BCBA’s and other therapists. Once your own profile is created, it is time to begin creating circles. There is a purple private circle which only includes the user. No one but the user can be in the private circle because it represents their space and their body. The blue circle is your closest family members. You may give intimate close hugs to these people. The green circle may include extended family or very close friends. The yellow circle includes friends and good acquantances. The orange circle may include acquaintances, close teachers, or others you know well in the community. The red circle may include police officers, doctors, and firefighters. There is also space outside of the circles. These are for strangers. It is called the red stranger space. As you are adding family members in each circle, you will create either an illustration or you will upload a photograph of them. Often, you won’t have pictures of each person in every circle you want to add. That is why I love the caricatures available. There are 40 to choose from and customize them as you like. Some children are very literal will want a picture of the individual but some may have more fun with the characters. My children loved the characters! This app has no parent controls or pass codes. There are no ads inside the app and it is designed with safety in mind because of that but their are links to the Circles website in the apps setting menu. I would definitely recommend setting up a passcode system in the future so it will only be accessed by parents and therapists overseeing the app. Download Circles in the App Store today!